A Child of the Civil Rights Movement by Paula Young-Shelton, tells the story of the civil rights movement with mention of Dr. King, and the role he played, as seen through her then four year-old eyes. Young-Shelton, the daughter of Civil Rights activist and former U.S. Ambassador to the United Nations Andrew Young, begins the story begins with Paula and her family moving from New York, where there were no Jim Crow laws, to the south, where inequality and Jim Crow laws ran rampant. She describes Dr. Martin Luther King, Jr. in a way many of us have rarely seen – a man full of joy with a twinkle in his eye – a man that the media rarely portrayed, but a man that no doubt did exist in the presence of his loved ones. In the story, Young-Shelton refers to Dr. King as “Uncle Martin,” because while he was not her blood uncle, she explains that like her father Andrew Young, Dr. King was part of the American civil rights movement family – a family she describes as frequently eating dinner together at one another’s homes, where like a biological family, they would have heated discussions together, many times about the next steps to take in the civil rights movement; and like a a family, they struggled through the era of inequality together, they worried together, and they marched together like a family from Selma, Alabama to Montgomery, Alabama – an event she is proud to have been a part of, since it led to the signing of the Voting Rights Act of 1965. 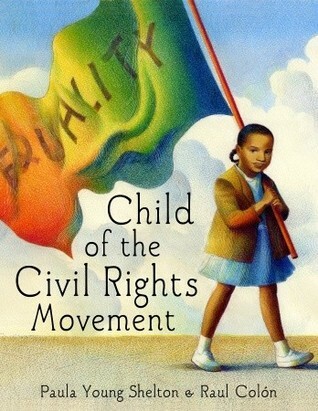 A Child of the Civil Rights Movement is beautifully told, and the illustrations by Raul Colon add to beauty of the book. From the expressions on the faces of the characters to the corn rows in young Paula’s hair, the illustrations vividly capture the essence of the story and those in it. A Child of the Civil Rights Movement is an interesting re-telling of the civil rights movement that children can understand, that will also keep adults interested. It is a thoughtful introduction to the civil rights movement, and stirs up emotions you don’t expect from a children’s picture book. I felt sorrow for the loss of Dr. Martin Luther King, Jr., but I also felt pride in the African-American leaders he worked with who like Dr. King, sacrificed time with their families; who were beaten and thrown in jail so that they and African-Americans could have the right to vote like those of white Americans. This book touches on these subjects and more in a way that will not scare children, but make them think about and realize how much they have to be thankful for – and those who helped them have the basic human rights they are able to live with today. This entry was posted in Activism, Historical, political, Uncategorized and tagged Andrew Young, Black History, children's book, children's books about racism, civil rights, equal rights, Jim Crow, Martin Luther King, Paula Young Shelton, Racism, Ralph Abernathy. Bookmark the permalink.